OMG! 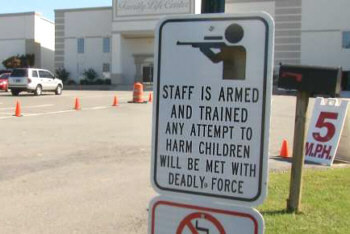 Guns in Ohio Day Care Centers! OMG! Be sure you are signed up for JPFO's periodical Email Alerts. Get a very aggressive defense of your rights. The New York Times' editorial board must be bored with their own anti-gun rights polemics. The Gray Lady's most recent addition to their civilian disarmament canon - bemoaning a forthcoming Ohio law restoring residents' right to keep and bear arms in day care centers (amongst other places) - lacks the Times' usual sense of moral outrage. "Is this really necessary?" they whine . . . The bill's sponsor claimed the legislation would end 'undue hardships' for license holders under current law that requires them to leave guns in the car while dropping off children. Under the proposed law, citizens would be able to tote their weapons into what gun lobby propaganda describes as 'victim zones' -- places presumably in need of vigilantism. Any reduction in 'gun-free-zones' has to be an improvement, but predictable resulting comments, written by the anti-gun media, will be based around the "blood-in-the-streets" approach with included misinformation. At the very least - they ignore police response times to incidents, choosing instead it seems to favor victims. "You don't have to be Jewish to fight by our side." © 2015 JPFO All rights reserved. "America's most aggressive defender of civil rights"
Copyright © JPFO 1999 - 2019. All Rights Reserved.